Last Sunday, 7th May, I got up at 05:25-ish, had a hurried breakfast, gathered a few things together and dressed in the appropriate clothing, then set off to cycle to Wales and back, at 05:52. I’d uploaded the route to a Garmin Etrex some time previously and had it fixed to the handlebars to provide turn-by-turn directions and record the track. I had been planning this ride for months and had researched the route meticulously. Conditions were a bit gloomy and cold as I set off and indeed they remained so for the first two hours, but I had leggings and three layers on top, so didn’t suffer too much. I made my way into Warwickshire, then pushed through into Staffordshire – I’d done some of these roads on a trip to Stafford and back last year so some of the ride up to that point was quite familiar. The Sun had started to penetrate the gloom by about 8AM and I warmed up nicely, thoroughly enjoying my adventure and the new scenery. Traffic was very quiet, in fact I hardly saw a car on the road for the first 90 minutes or so. I negotiated the rather industrial dual carriageway section at Rugeley, then out westward into rural Stafforshire again. I stopped at one of those little village shops with a bench outside at a place called Sandon, after about 40 miles. I consumed an egg mayonnaise sandwich there and bought a flapjack for later. 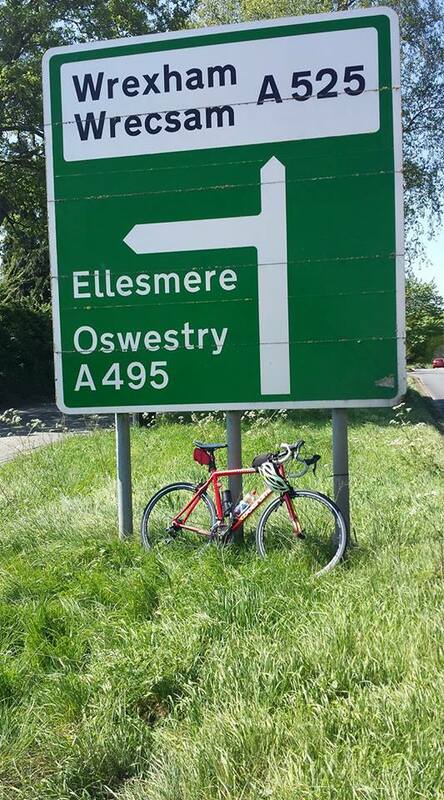 I cracked on through Stone, then pushed through a challenging hilly section into Shropshire then pressed on into Cheshire, enjoying pleasant scenery most of the way. Then at about 12:20, I crossed over the Welsh border west of Whitchurch. Sadly the ‘Welcome to Wales’ sign that is evident on Google Street View is no longer there in real life, robbing me of the photo opportunity I’d anticipated, so I made do with a snap of a tourist information notice at the first layby over the border, and a pic of the bike leaning against a road sign presented partly in Welsh. I examined my rear tyre, because for a mile or so from the target I’d started to feel the road noise through the seat a bit more sharply than usual – and it was indeed a bit soft. So I unclipped my ultra-portable mini bike pump from the frame and attempted to connect it to the valve. With laughable optimism, I hoped the puncture was slow enough that I’d get away with pumping it up three or four times on the way back. Sadly the pump clearly didn’t fit, and closer inspection revealed that it was in fact intended for Schrader valves, not the Presta valves fitted to my road bike. I’d never once tried the pump since I bought it. All I’d managed to do was to remove the remaining pressure from the tyre. But I flagged down a passing cyclist ten minutes later, and he had an emergency sealer / inflator canister which he kindly gave to me. I managed to get decent pressure into the tyre with it, and hoped that the white foamy sealer that it dispensed into the inner tube would do its thing. So I set off homeward, but within two miles the tyre was starting to be unusably flat again. I have to say that although I was grateful to have the inflator, I wouldn’t bother buying one. The sealer gunge in it didn’t seem to work at all. Anyway the inflator still had a couple of shots in it, and by redoing the tyre and riding standing on the pedals with my weight over the front wheel, I managed to get to a little village called Burleydam, a few miles closer to home, where I stopped for refreshments at a pub with a roadside beer garden. I was feeling pretty dejected at this point. I reinflated the rear tyre for a few minutes with the last gasp of the inflator, and using the same front-wheel heavy riding technique, managed to get to Audlem, a few miles further on. By the time I got there I’d come roughly 10 miles from Wales, but was still more than 60 from home. The tyre must have picked up its puncture a few minutes before I arrived in Wales. How unlucky do you have to be to get a puncture within a mile of the most distant point of your longest ever road trip, after going for literally thousands of miles without one? But I have to confess that I knew the rear tyre was well past its best. I reasoned that since it had done several thousand miles without a puncture, it was probably good for another 144. But in reality it was not providing adequate protection for the inner tube. I sat at a picturesque bench under a shelter in the middle of the town. After a few minutes a kindly elderly man came pootling along on an electric bike, so I asked him if he had a pump. He said that he had a stirrup pump at home and would be happy to go and get it. I thanked him and he set off to get his pump. I could see that his bike’s tyres had Schrader valves (the kind you find on a car normally, not a road bike), but hoped that his pump had a dual head, like mine. I decided that my best bet at this point was to swap in the spare inner tube I had with me and wait for another cyclist to come along with a pump. So I did that. I’d borrowed the disposable nitrile gloves I normally keep in the saddle bag a few weeks ago and never replaced them, so my hands got filthy of course. But at least it was easy enough to get the tyre off and on the rim – a few thousand miles of wear had loosened it up. I checked the rim carefully – it didn’t seem to be worse for wear from riding a semi-flat tyre. Once I’d done this I stood the bike up again, fitted the wheel back on and started putting things away in my bag. I looked at the disposable inflator closely, then smacked my head. It had a Schrader – Presta adaptor screwed onto the end of its nozzle. Just as well I hadn’t thrown it away at the pub in Burleydam once it was finished. Fortunately the pleasant old bloke with the electric bike and stirrup pump had decided to while away half an hour at the bench, so I borrowed his stirrup pump, fitted the adaptor – and managed to inflate the tyre to full pressure. I thanked him profusely and very happily set off homeward. I was a bit nervous of picking up another puncture, given that the rear tyre was obviously worn down a bit. But after twenty miles or so I started to relax again and enjoy the ride home. The strong sunshine had warmed me up somewhat so I stopped and removed my leggings and one top layer, and stuffed them into my back pack. I stopped at Stone for a coffee at Costa Coffee and a bought a bottle of water. The rest of the ride remained enjoyable and I seemed to have plenty of energy left, which was a relief. I’d taken a couple of energy gels with me and consumed one with about 50 miles to go. I don’t like them and don’t use them normally but I’d decided I’d need all the help I could get over a ride of this distance. I’m sure it did help. This one (tropical flavour) wasn’t as unpleasant as the first one I tried a couple of years ago (apple). The key to a long cycle ride is frequent and adequate refuelling and hydration. I made it home seven minutes before sunset, having cycled 144.2 miles. My previous record was 101 miles. I’d added Shropshire, Cheshire and Clwyd (a “preserved county of Wales” according to Wikipedia) to the list of counties to which I’ve cycled from my garage door, a set which previously only included the neighbouring counties of Leicestershire. I’d fitted my Garmin and my DAB radio with Energiser Ultimate Lithium disposables, and they both lasted all day. Very impressive. The Garmin was actually still showing four quarters on the battery symbol when I switched it off after 14 hours, 45 minutes. One nice aspect of this particular route is that I had the Sun behind me both ways – travelling westward in the morning, and eastward in the afternoon. I was poorly prepared for this one, I must admit. I’d planned the route properly, had the Garmin set up, had a fully charged smartphone and spare battery (Google Maps is a cyclist’s best friend). The bike was well lubricated. I had a spare inner tube and tyre levers, plenty of money, food, fluids and adequate clothing. I was certainly adequately fit. But I was relying on an untested tyre pump and a rear tyre that I should have replaced about 300 miles previously. Thousands of miles of incident-free cycling had lured me into a false sense of security. I will not do a ride of any significant length without preparing properly again.